Potty? What potty? It’s even easier for your Bear Cub to get wrapped up in fun and forget about going to the potty when she’s away from home. While your Bear Cub is pretty adaptable and won’t be bothered by new situations, she will need reminders to help get to the potty on time. Here’s how you can help. Use the Time to Potty app, setting it to fewer minutes than you use at home in order to allow for more time to find a restroom when you’re traveling. The world is so full of interesting things that your Bear Cub may need some help remembering to stop and have a potty party now and again. When you’re on longer trips, give your child the option to wear Pull-Ups® even if he’s regularly in underpants. 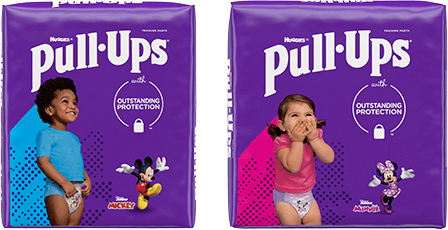 A child who is sometimes in underwear but who will be going on a long trip will probably do best wearing Pull-Ups. Explain by saying, “Things are going to be different today and sometimes we won’t be able to get to a potty fast enough.” However, a child who regularly wears undies might feel insulted by having to wear Pull-Ups again. For these children, you might bring some Pull-Ups along and have them handy just in case they’re needed during the trip.